Episode Guides for highly influential and relevant Crash Course Business Soft Skills YouTube Series! This is a simple, no-prep necessary, way to integrate some "life skills" into your curriculum. Whether you teach a business course, or simply want to give your students some practical instruction on how to get a job and be successful in the workplace, this is a resource that will allow you to give your students the tools they need to succeed. Many teachers want to teach students the important life skills that they need, but just don't have the time to do it. This is an easy way to integrate some of that learning, without compromising any of the other material that you need to be teaching. Simply show 1-2 episodes a week for the last 10-15 minutes of class. Your students will receive some highly valuable, applicable learning that they can reflect on later and apply as they move into the working world and for years to come. Or, if you have more time available to you, these episodes are full of discussion starters, and springboards into potential hands-on activities that can help students reflect on the topics discussed and prepare for real-world scenarios. I have found that an episode of "Crash Course" can easily fill a class period as we re-watch important parts of the episode, and then discuss it in depth as we apply the various key points. Ep. 1: "Why you need Trust to do Business"
Ep. 2: "Defense Against the Dark Art of Influence"
Ep. 3: "The Secret to Business Writing"
Ep. 4: "How to Speak with Confidence"
Ep. 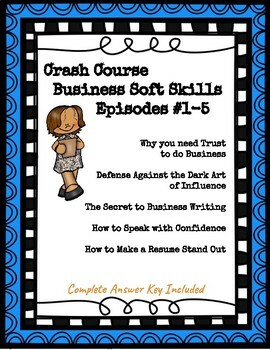 5: "How to Make a Resume Stand Out"
What is Crash Course Business-Soft Skills? Crash Course Business-Soft Skills is a highly relevant YouTube series that is a fast paced, informative, course that will give students the tools that they need to succeed in the professional working world. Though the episodes are dense with facts and helpful information, they are still presented in a way that is very accessible to all learners. A link to the episodes is provided in this product. These 15 minute episodes make an excellent filler for your class period, and are something that you can squeeze in at any point during the year. Or, use the guide as a spring board for a class discussion and/or hands on lesson that can easily fill an entire class period or more. Thank you for considering my product! 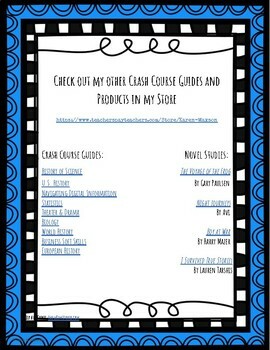 Additional Crash Course Business products can be found here.